Department of Radiology, University of Cambridge School of Clinical Medicine. Honorary NHS Consultant Neuroradiologist – Addenbrooke’s Hospital, Cambridge University Hospitals NHS Foundation Trust. Tomasz Matys graduated from the Medical University of Bialystok in 1999. After obtaining PhD in medical sciences/pharmacology in 2001 he was involved in basic neurosciences research as a Postdoctoral Fellow at the Rockefeller University in New York, USA (2002-2005) and at the University of Leeds (2005-2007). His basic radiological training (as a NIHR Academic Clinical Fellow) and specialist Neuroradiology fellowship were undertaken in Cambridge. He was appointed to the current University Lecturer position in 2014. 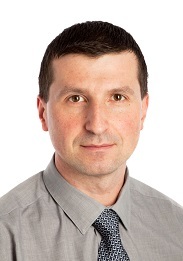 His main research interest is Neuro-oncology with a particular interest in using MRI and PET for characterization of the extent of primary and secondary brain tumours, predicting treatment response and prognostication. His other interests include meningioma and pituitary gland imaging, multiple sclerosis and neuroanatomy. He is interested in medical education and he is a current Undergraduate Specialty Lead for Radiology at the School of Medicine. Overview of Neuroimaging. T. Matys, T. Das, D. J. Scoffings in “Oxford Textbook of Neurological Surgery” (ed. R. Kirollos, A. Helmy, S. Thomaon, PJA Hutchison, Oxford University Press, in press). Physics MCQs for the Part 1 FRCR. S. Ilyas, T. Matys, N. Sheikh-Bahaei, A.K. Yamamoto, and M. Graves (Cambridge University Press 2011) – Ultrasound physics and MRI physics chapters.